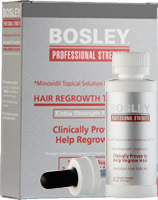 Bosley Hair Regrowth Treatment is F.D.A. approved containing 5% Minoxidil Regrow treatment for Men only and 2% formula is for Women. This treatment is clinically proven to help regrow hair and slow down or help halt hair loss in some cases.